The romanticised notion of declaring your love through the gift of an eternity ring dates back more than 4,000 years ago when Ancient Egyptians carved out bone, metal and beads to represent the belief that not even death could break the bonds of marriage. There are a number of conflicting opinions on when an eternity ring should be given. Based on the traditional list of anniversary gifts, an individual wouldn’t receive a diamond eternity ring until the 60th wedding anniversary. However, it is becoming more common to receive an eternity ring on the 1st or 10th anniversary. Recently the eternity ring has also become a symbol for the circle of life and is now a trend to gift it upon the arrival of a first child. There are two types of eternity rings most commonly chosen; full gem-set and half gem-set. A full eternity ring is when the diamonds or gemstones form a continuous circle, whereas the half eternity ring covers only the front face of the ring. As the rings are often made up of multiple delicate diamonds or gemstones, the setting that you choose will affect the durability of your ring and you should carefully consider what style is best for you based on your lifestyle. As eternity rings are traditionally worn as part of the wedding ring set, you may also wish to consider how your eternity ring looks alongside your engagement and wedding band to ensure that they compliment each other aesthetically. Despite this, many clients also choose to opt for a more extravagant design to feature on its own on the right hand. This enables you to select a more unusual design, which might incorporate colour or more personal design traits. 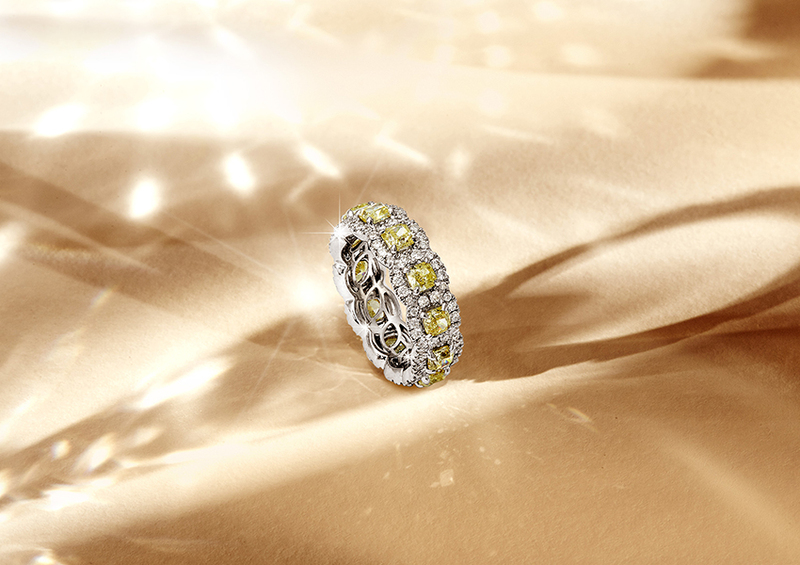 Our Yellow and White Diamond Eternity Ring is a beautiful example of how to subtly incorporate colour into your eternity ring to make a statement. The combination of white and yellow diamonds is an alluring mix of classical beauty and individual style that acts as a symbol of your everlasting love. If you are considering purchasing an Eternity Ring, contact the boutique today to arrange a bespoke consultation with Matthew Ely.